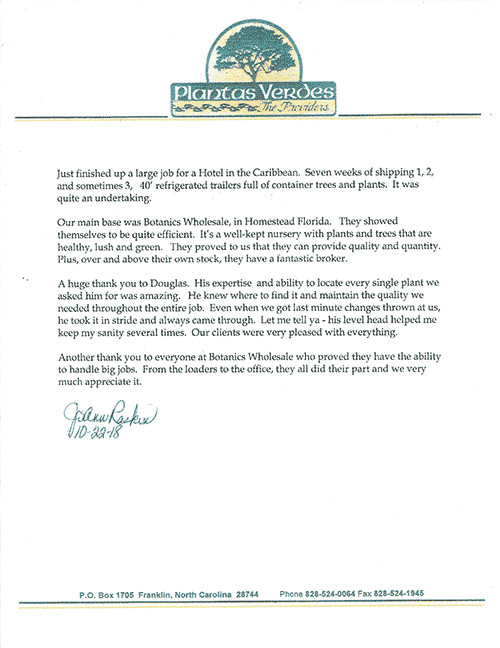 We have been buying palm tress from Botanics Wholesale in Homestead, Florida for 18 years. We couldn’t be more pleased with the great service, the quality of the product, the on time delivery, and especially the great value! 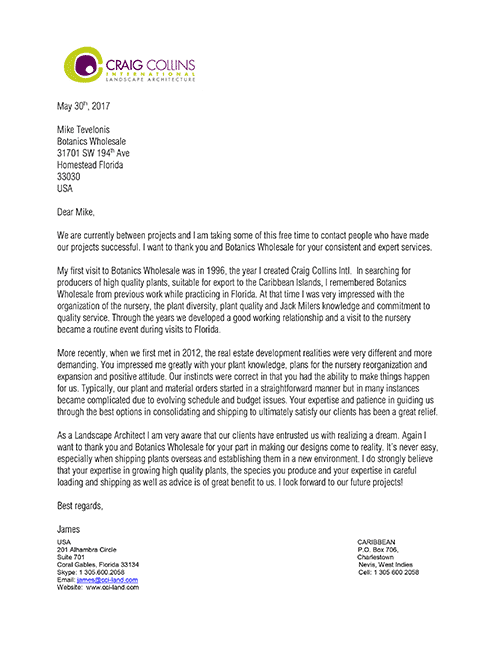 Mike and the whole crew are a pleasure to do business with and we highly recommend Botanics Wholesale. We have been interacting with Mike and his team since 2015, and wanted to go on record with a “high five” to thank him for his excellent customer service in our plant and tree related needs since we first came in contact. In late 2015, I sent out a request for quote for a container load of plants I needed to be prepared and shipped to the British Virgin Islands. 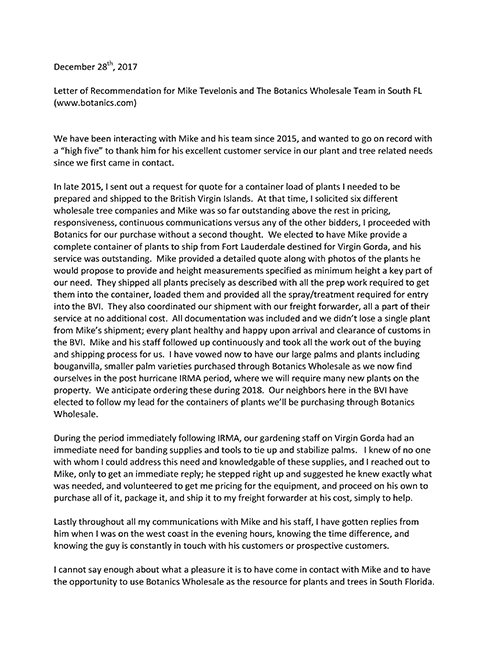 At that time, I solicited six different wholesale tree companies and Mike was so far outstanding above the rest in pricing, responsiveness, continuous communications versus any of the other bidders, I proceeded with Botanics for our purchase without a second thought. My first visit to Botanics Wholesale was in 1996, the year I created Craig Collins Intl. In searching for producers of high quality plants, suitable for export to the Caribbean Islands, I remembered Botanics Wholesale from previous work while practicing in Florida. At that time I was very impressed with the organization of the nursery, the plant diversity, plant quality and Jack Milers knowledge and commitment to quality service. Through the years we developed a good working relationship and a visit to the nursery became a routine event during visits to Florida. Just finished up a large job for a Hotel in the Caribbean. Seven weeks of shipping 1,2, and sometimes 3, 40′ refrigerated trailers full of container tress and plants. It was quite an undertaking. 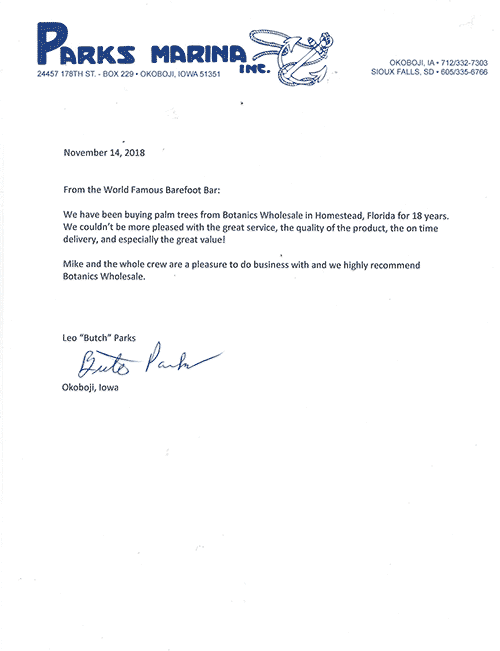 Our main base was Botanics Wholesale, in Homestead Florida. They showed themselves to be quite efficient. It’s a well-kept nursery with plants and trees that are health, lush and green. They proved to us that they can provide quality and quantity. Plus, over and above their own stock they have a fantastic broker.